Here’s what you came for: M. Night Shyamalan’s GLASS isn’t very good. You will hear how disappointing the outing it is for the director who —to be generous— has come in and out of favor with critics and fans throughout his career. His latest promised an epic battle that concludes the story started with Bruce Willis (David Dunn) in UNBREAKABLE and continued with James McAvoy in SPLIT. The high-concept never quite ventures out of the shallow end of the pool, none of the ideas are deep enough to warrant another trip into this world. Despite how much audiences wanted another adventure following SPLIT. 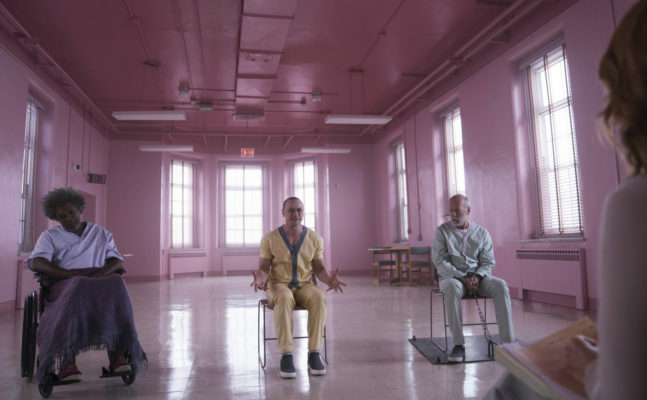 GLASS’ lackluster vibe hints at a director who has become uninspired. It’s shocking, but shouldn’t be so surprising that the buildup for GLASS ended up being a shattering disappointment. Shyamalan had all the steam going in but finished in a dull conclusion to what was a moody and thrilling buildup. We pick up with David Dunn (Bruce Willis) and his son Joesph (Spencer Treat Clark) as if no time has passed since we last saw them at the end of UNBREAKABLE. Although it doesn’t feel like time has passed, David’s new identity as the rainslicker-wearing vigilante known as “The Overseer” who has partnered with his son to keep the streets of Philadelphia safe. UNBREAKABLE is an amazing film and arguably Shyamalan best, and the father/son dynamic in that film is just beautiful and aching in so many ways. Joseph looks up to his father like a fan looking up to a superhero; Shyamalan can be incredibly clever when he is being meditative. There’s none of that with GLASS. No subtlety, no heart. The father and son duo are tracking down Kevin Wendell Crumb aka Dennis aka Barry aka Hedwig aka Jade aka The Beast (James McAvoy), who is still suffering from D.I.D. and is still out there kidnapping and murdering young women who haven’t felt enough suffering within their life. Meanwhile, the villain and mastermind of this show, Elijah Glass (Samuel L. Jackson), is pulling the strings within a mental institution where he has broken now 94 bones and is still going strong. His big plan is to get The Beast to climb a building and kill people on live TV so that he can prove super-human beings exist. For a person with an incredibly high IQ, you’d think he could come up with a plan that wasn’t the ending of KING KONG. Shyamalan should have called this movie SPLIT because, damn this screenplay is going in too many directions. So much to the point, it all becomes meaningless and it hurts because I really wanted to enjoy this movie. Yes, we see McAvoy bolstering all those wonderful personalities from a curious 9-year-old to a fashion designer. Yes, it’s fun to watch…until it finally isn’t. We all knew Bruce was going to phone it in and we want Sam Jackson to act his tail off and wax poetic while musing about evil plans, but instead we are dropped into a dull hospital drama. And not to mention that the suspicious Dr. Ellie Staple (Sarah Paulson) becomes nothing more than an after-thought. 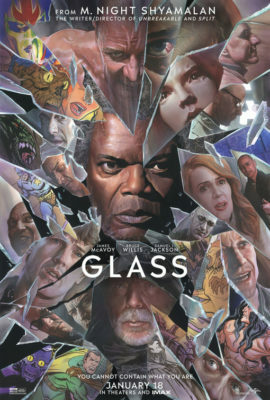 GLASS just doesn’t feel like the kind of film Shyamalan should be creating at this point in his career’s Renaissance. When the stage is set and the film is going into its climatic moments, the action hinders the narrative beats by getting in the way of the lofty allegories and assuming we all care about the mystery of comic books. We don’t we just want satisfying stories. GLASS was a balancing act that unfortunately just tipped over. There was too much weight to carry one film. The scope was broadened, but none of the characters motives, or directions take a step forward, everything reaches a logistical conclusion and with Shyamalan, I’m not so sure logic is the best option. The director that made UNBREAKABLE isn’t coming back, for a filmmaker who has mastered the art of the twist this outing is just rather pedestrian.